(1)Extended fault detection and protection. Customers can read the error code in Palnel also. (8)A 4pin connector to RS232 cable allows for configuration. 20) User program provided. Easy to use. No cost to customers. 21) Support motors with any number of poles. 22) Up to 70,000 electric RPM standard. (Electric RPM = mechanical RPM * motor pole pairs;Motor pole pairs=Motor poles/2). •Configurable battery voltage range, B+. 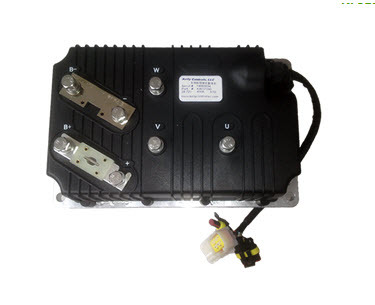 Max operating range: 18V to 1.25*Nominal Voltage( max.180VDC). •Motor Current Limit, 1 minute: 400A, depending on the model. •Motor Current Limit, continuous: 160A, depending on the model.